Feedback will be STANDARD 6 of the new Aged Care Standards, which we transition to and which come into force on July 1, 2019. Below is a descriptor of what Standard 6 is all about under the New Australian Aged Care Quality Standards. 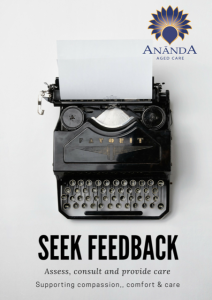 So how does Ananda Aged Care demonstrate this? 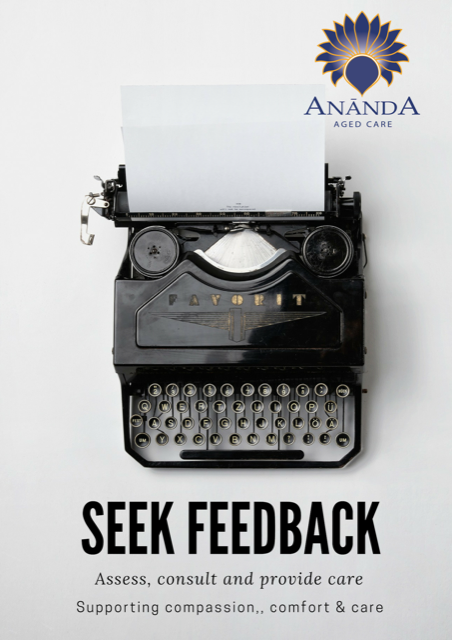 At Ananda we take feedback very seriously and acknowledge it comes in many forms. It provides us feedback on what we are doing well, areas we need to work on and opportunities for important. Our “Blue” Feedback form was developed for use by residents, Families/NOK and Staff to assist us in improving care and service delivery. The feedback forms are available throughout the home next to the locked letter boxes. In October 2018 we introduced a “capturing feedback form” to better capture the verbal feedback from residents, families and next of kin. We spend a lot of time supporting the residents that during all interactions our residents / families provide feedback. We wanted to further capture this. All staff can complete these forms and they are located in all nurses stations and by front reception. (See video: how to complete a feedback form below). Email – a lot of families and residents have taken to email to provide feedback. This provides me with an opportunity to provide timely and “hopefully” resolving interventions. Staff meetings – again a way we present feedback to staff and gather feedback to make a difference or celebrate our success. How to submit feedback via the blue forms (for residents/visitors) and the white ‘feedback captured’ forms for staff (2 minutes 25 seconds). Without feedback how do you know what we are doing well and what we need to improve on? Together feedback keeps us all informed and ensures we are all working together for the best outcomes for our residents. Karen Daniels, Director of Nursing.